I first heard of the Growing Power organization from a documentary on Netflix. It’s a true story. But usually when we watch documentaries about food, agriculture, and health, we see some hippie commune (I mean that in a nice way) in California or out on the West coast. For once, they were talking about a non-profit group in the Midwest that was based out of Milwaukee and operated urban farms in Chicago. Considering both Danny Boy and I know absolutely nothing about farming and gardening, I decided it would be a great place to start learning and help out an organization whose goals we feel enthusiastic to support and help out. We arrived on a Saturday morning for the volunteer orientation on a very cold and sad January morning. But regardless of the cold, we had a great day. Had a little tour of the urban farm and got to learn about how they can farm all year round (which I admit I didn’t think possible). I recall Dan asking how anyone could farm in the city limits of Chicago. I believe my response was something along the lines of, “They must of figure something out or people would have died from it by now.” It turns out they did figure out a method but not one I expected. It turns out there is no way to purify the soil in Chicago. The people at Growing Power purchased a paved over lot and use the pavement to seal off the bad/corrupted soil and cover the pavement with fresh composted soil. I was not expecting this was the solution to city pollution. I also had no clue how easy and beneficial it is to compost food scraps. I am considering finding a way to save my food garbage to bring and add to their compost. I still need to find a way to do this without my apartment smelling horrible! The next thing I learned is that they can grow things like spinach and beets and tons of other things even in the cold winter. These little huts they made weren’t fancy greenhouses with glass windows. They were made with fencing materials and large tarps. I couldn’t believe the temperature difference when we entered. I almost expected them to have used an outside heating source. PS – Thank you “greenhouse effect”. I thought that was just something they taught us in elementary school that really didn’t change my life in any way. So why drive into the city limits and volunteer at an Urban Farm rather than go to farming areas just south of where I live? There is a really good reason I wanted to help this organization. If you don’t live in a big city, you may not know what the lower class neighborhoods like look. Yes, you may see video in the news, but there’s things you don’t notice unless you drive and see it yourself. One thing these inner city areas lack are real produce markets and grocery stores. In many areas, you only find little corner shops with nearly expired processed foods. Now don’t get me started on processed foods and why they are bad for you. But imagine being raised in a neighborhood where you can’t get whole fruits and veggies? How would your health and happiness be affected in this type of environment? 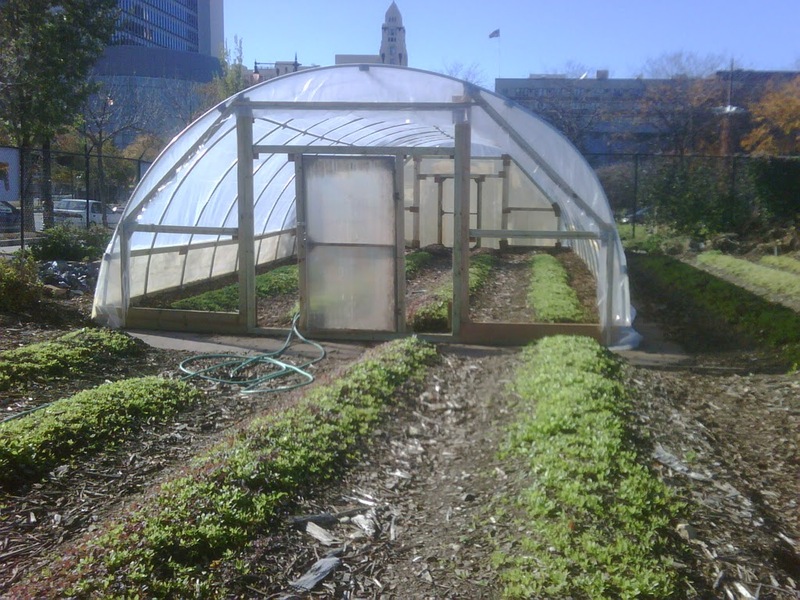 Growing Power Chicago makes an effort to bring agriculture and fresh produce to the city. They are a non-profit organization with a mission that includes both educating people about the health benefits of locally grown produce and helping rebuild the inner city neighborhoods from within. While I may not have the extra money to donate to their cause, I will continue to volunteer there throughout the year. I hope to spread the word of their mission. You can contribute to Growing Power by sending me cash… Just kidding! Go to their official website and find a way to help out or share their message! So far, I’m making 2013 quite productive! I’ve kept my promise to give up meat and am doing well. Being meat-free has made me a happy girl! Now, I have exciting news. I’m doubling up on my blogging efforts and will be positing under two sites. I’ll continue my personal and clumsy stories here on Col Says, but I will also be posting on Chicago Now’s Banned Books Blog. Please go and subscribe! I’ll be reading through banned books and discussing the books as texts as well as the subject of censorship and reflecting on the society that tries to ban it. Seriously go and subscribe! It’ll be a fun time, I promise! So far, Dan and I have done well with cutting meat from our eating. Neither of us has felt any temptations and I have been scouring the internet and the bookshelves of libraries for new recipes. I’ve managed to make a lot of great vegetarian dishes in the past few years, but there are always things I’m afraid to try in the kitchen. The first one is baking my own bread. I have a fear of doing this as well as making my own pizza dough. There are just things about it I don’t understand. First of all, what is yeast? What does it mean to knead the dough or let it rise? I’m sure I could short cut the process with a bread-maker, but the best things in life are not taking the shortcuts. What if I end up in a situation where I can save the world if I bake a loaf of bread from scratch without using a bread machine or pre-made dough. Now I did manage to make my own pesto recently, and it turned out good. I started a new Pinterest Board to collect my vegetarian and vegan recipes. So expect some new pictures and updates as I try some new recipes and modify them. I can’t resist a recipe that I don’t modify or make changes to… I just can’t. One recipe I found that I cannot wait to try out is Vegan Rice Cereal Marshmallow Bars. I grew up loving those bars from Kellogg but it does not fit into a diet that avoid processed foods. This will be a fun challenge to bake. My next post will be a good one. My first How To Guide for making perfect Sunday morning pancakes! I don’t know what’s been in the air lately, but Danny and I have just been watching through every documentary we can find on Netflix. Documentaries are fun to watch, but I always watch with a weary eye. It’s not that I think documentary-makers are liars or trying to stretch the truth. But with any “text,” the creator brings their own perspectives to both the gathering of information and the presentation of ideas. This is unavoidable and applies to every type of communication and art. So last night, we watched “Walmart: the high cost of low prices”. 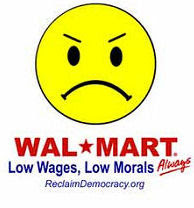 I wasn’t shocked or surprised since I already knew a lot about the class action law suits against Walmart as well as the efforts of the company to stop any type of unionizing for their associates. But this documentary definitely had it’s place in my opinion. First of all, it proved my point to Danny that “trickle down economics” doesn’t work because it relies too much on the wealthy choosing to let the benefits trickle down through job creation. At the end of the documentary, I had an interesting question. I asked Dan, “If I told you right now, you had to go out and purchase an entire outfit of clothes not made by a corporation, where would you go?”. After asking this question, neither Dan nor I could answer it. We’ve become such a corporate world that it feels impossible to buy hand-made, locally-made items. It’s bad enough food is flown all around the world, but now it is also apparent that everything we purchase is made around the world. I think we may be ready to join a hippie commune of home-grown foods and self-made clothing. However, it’ll be some time before we can wear clothes that look normal and potato sacks will have to do. If I start wearing a potato sack, do I appear to be more Irish? Just a thought…. So my first post of the year boasted that it was time to buckle down and throw meat from my diet. I wanted to show off some of the fun stuff we’ve made so far and all of it has been delicious. This turned out great. We tried making the eggplant chips with the skins still on, but I felt tingle on my tongue and lips. I was reminded of my allergic reaction to kiwi. So I didn’t eat anymore of the eggplant but I enjoyed many sweet potatoes. Our first time cooking with Quinoa was exciting. We definitely plan to add more Quinoa dishes in the future. Soups and I don’t really get along when in the kitchen. I’ve tried making soups before and they often don’t go so well. Either they lack taste or the veggies didn’t cook all the way through. So making creamy tomato soup, I decided to ignore recipes and use my instincts. I’m so happy it actually turned out edible. We used a soup base from Trader Joe’s: Roasted Red Pepper and Tomato Soup and chopped 6 six vine tomatoes and a few garlic gloves. I threw in some spices and mashed cauliflower (to add some creamy texture). If I made this again, I might leave out the cauliflower and simmer for less time. 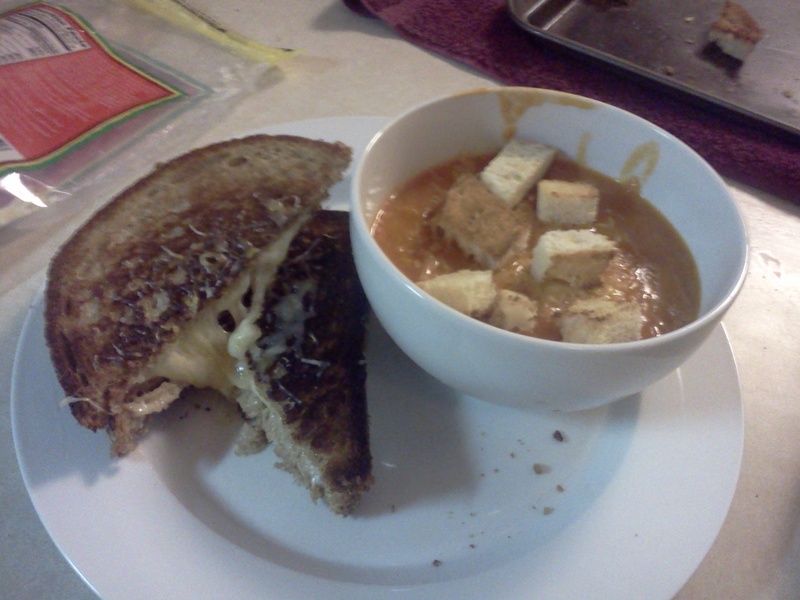 But the grilled cheese turned out perfect and we made the croutons ourselves. We had some Italian bread that was going bad soon. So I chopped it and broiled it with some garlic and voila! These pancakes were so delicious that I decided to write a whole separate post “How to Perfect your Pancakes”. These were cooked with chopped blueberries and topped with sliced bananas and organic maple syrup. I used multi-grain pancake mix from Trader Joe’s, and I don’t think Dan and I said a word while we were eating. I recall grunts of approval and happiness from Dan. If you want the recipe let me know! If you have any tricks to perfecting soups, please share them! Look forward to my next post about my Pancake Perfection!!! 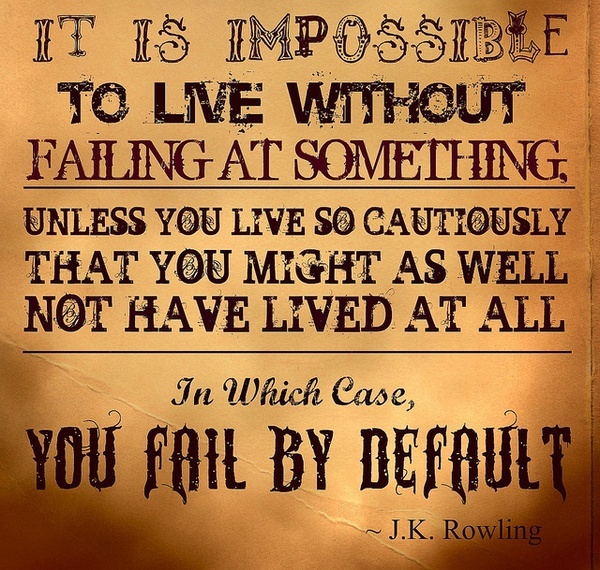 Failure is often associated with school, courses, and the overall outcome. But when we think of failure in terms of life, it is difficult to place the label on failure on anything. The way I see it, life is a constant process of revisions and additions. So until you stop growing as a person, the label of failure is never present. This is a great quote that I found helpful in my life. If you don’t take chances, you live too carefully. If you don’t try new things, you can miss out on real learning experiences and opportunities.